Tim Lincecum Being Tended To By Paramedics In NYC Hotel? Apparently, Giants' young gun Tim Lincecum was seen being tended to by paramedics at the Grand Hyatt Hotel in New York City. "Could be just the flu", the tipster said. San Francisco Giants pitcher Tim Lincecum was taken to a New York City hospital Tuesday afternoon after complaining of not feeling well, a Giants spokesperson said. That same spokesperson said Lincecum was dehydrated and had flu-like symptoms. Lincecum is in New York for the All-Star Game, but began complaining before the red carpet ride through midtown Manhattan on Tuesday. The Game is tonight in the neighboring borough of the Bronx. Lincecum will be hydrated and monitored at the hospital. 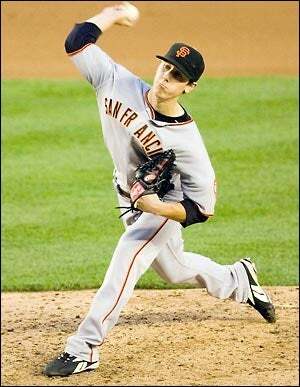 Lincecum, a 24-year-old righty in his second major league season, last pitched on Sunday, going eight innings in Chicago and beating the Cubs to run his record to 11-2 with a 2.57 ERA and 135 strikeouts. This was his first All-Star Game. More when it happens...on the ominous "flu-like symptoms."